Rob Sturrock and Dr Peter Ferguson give some hard truths about the security implications of climate change now and in the near future for Australia and the Asia-Pacific region. In their June 2015 report they claim that climate change is the threat equivalent to a hundred years war, which Australia and the Australian Defence Forces (ADF), are ill prepared for on a strategic level. "Without intending it, we are confronting a threat akin to a Hundred Year War." say Sturrock and Ferguson. While the Government focusses on hardware upgrades such as new submarine contracts and traditional short term defence asset replacements, the essential strategic planning for operating in a climate changed world is being sorely neglected. 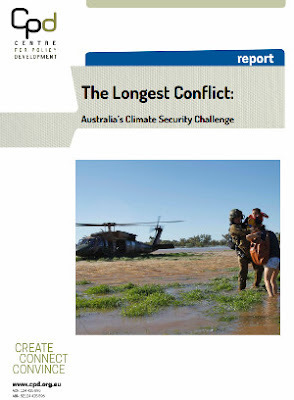 Their report, The Longest Conflict: Australia's Climate Security Challenge (Download the PDF) was released in June 2015 by the Center for Policy Development. According to the report authors, defence personnel indicate that climate change will not feature strongly in the upcoming Defence White Paper, due for realease in late 2015 or early 2016. The 2014 Defence Issues Paper, while identifying many security threats and opportunities, neglected to mention climate change was one of them. "This would mean a regression from, not advancement towards, a systematic approach to address Australia’s climate security challenge." say the report authors. At the launch of the report, Center for Policy Development CEO Travers McLeod said in a media release (PDF) that whilst militaries like the US and the UK take climate security extremely seriously, Australia is woefully under prepared and falling further behind. "Australia is extremely vulnerable to climatic impacts such as prolonged incidents of extreme heat, changed rainfall composition, sea level rises and more frequent natural disasters. "Australia is also in a region with the most vulnerability to climate change. Seven out of ten of the world’s most vulnerable countries to climate change are in the Asia-Pacific. By 2030, approximately 879 million people will live in low elevation coastal zones vulnerable to storm surges and sea level rises, with 70% of these residing in Asia. "The Federal Government must urgently develop our military preparedness and readiness to respond to the climate security crises forecast by our closest allies. The study warns that Australia's defence assessment and strategic preparedness for the security implications of climate change is woefully inadequate and unlikely to improve in the current political environment due to it's strong politically partisan and divisive nature. Food security increasing with breakdown and disruption to food production and transport due to changes in precipitation intensity and variability, extreme temperatures, drought and flood events. Decline of agricultural productivity due to reduced water availability for irrigation. Decline of nutritional yield in crops due to higher levels of atmospheric CO2. Sturrock and Ferguson note that Asia is in the front line for climate change crises, facing extreme weather events with a more vulnerable population and less facility for adaptation programs. Shortages of food, water and energy combined with climate change to produce a 'perfect storm' for social upheaval, according to Sir John Beddington, former UK Government Chief Scientific Adviser. Climate change is increasingly seen as a threat multiplier which exacerbates political instability in less developed or weaker nations causing social unrest, uprisings, and refugee crises. A number of researchers have identified that climate change induced drought and water shortages and reduced agricultural productivity may be an important underlying motivating factor in the Arab spring uprising in Egypt and Syria. We have seen the social unrest and upheaval in the middle-east with the imposition of fundamentalism and war creates the desperate movement of huge numbers of people seeking refuge and more security in daily life and living standards. Hence the current crisis in Syria and Iraq driving large numbers of refugees to seek asylum in Europe. Sturrock and Ferguson urge in the report that "Australia must prepare for a changing security environment in Asia. We must also prepare for a higher level of ‘humanitarian’ deployments. "Our best strategic approach is for Australia to be a regional leader in preserving human security alongside our partners in preparing for a climate changed world." "In order to provide a roadmap for achieving stability, an effective national security strategy needs to address all issues that pose a risk to national interests and wellbeing. The evidence is already there demonstrating the dangerous and long-lasting climate security risks. If a national security strategy does not reflect these risks it is fundamentally flawed and undermines a nation’s ability to achieve longer term stability." The Australian Defence Forces (ADF) face huge challenges with integrating climate change assessment and planning. Increased severity and frequency of extreme weather disasters is likely to require a greater role by the ADF in disaster relief such as assisting in recovery operations after Cyclone Pam devastated Vanuatu. 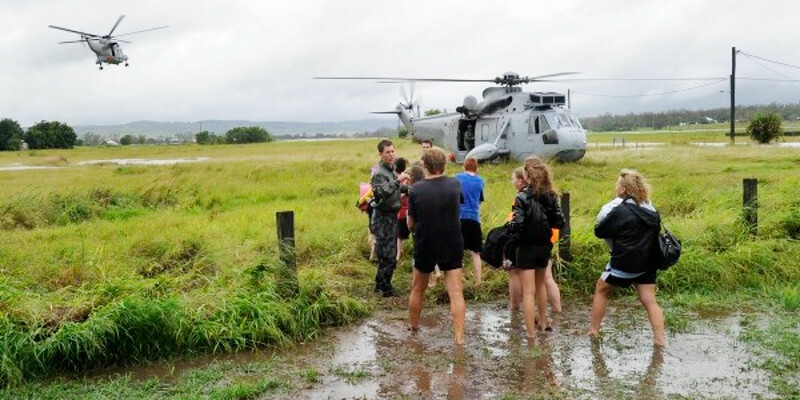 The Australian Defence Force will increasingly need to be called upon in situations like supplying Rockhampton during the January 2011 floods caused by a strong La Nina, or the evacuation of the Bundaberg Hospital during the floods in January 2013. Regional disasters are likely to produce population displacement and instability in the region which may require ADF involvement in stabilisation programs. The ADF may be subject to multiple concurrent demands for disaster relief and stabilisation across Australia and the region. It is this last where the ADF may be called upon on multiple fronts at the same time thus over-stretching it's capacity, thus posing one of the huge challenges. Some preliminary risk assessment has ocurred including a recent Defence Support Group $2 million study into sea level rise impact on defence bases, that remains classified. Most of our naval facilities will be affected by sea level rise and will need to adapt or relocate. It is also obvious that the defence Force is poorly equipped for energy efficiency and self-sufficiency and this too needs to be actively addressed. Sturrock and Ferguson warn that Australia lags a long way behind the US and UK in incorporating climate risk with "the perception of an institutional reluctance to address this critical security challenge comprehensively. The sum of the parts ... demonstrate an understanding of the threat, yet without a guiding compass." Create a Climate Security Strategy incorporating a need for national and regional disaster relief; identifying where climate change will act as a threat muliplier in the region; and preparedness of the ADF across capacity, capability and resilience. Engaging a defence climate strategy may also provide commercial and economic benefits, argue the report authors. Design, development and production of low carbon defence technologies offers opportunities for Australia’s defence supply industries to develop niche markets and first-mover advantages. "Commercial opportunities can be used to bolster the argument for ADF adaptation. DoD can draw together agencies within the establishment such as the Defence Science and Technology Organisation and Defence Materiel Organisation as well as utilising Team Australia, a Federal Government defence initiative enabling commercial collaboration between public and private sectors. Collaboration in this way can seek to find commercialisation and export opportunities for Australia’s defence responses." says the report. It is clear that the very limited 'Direct Action' policy approach is insufficient and the report argues strongly for a 'whole of government approach' to addressing climate change. The report provides a quote from Admiral Chris Barrie warning about Australia’s current position on the climate security challenge, "At the moment it is very hard to envisage conditions short of serious crisis in which a whole of government approach to climate security will develop". But that crisis is already present manifesting in deadly heatwaves and bushfires, increasing torrential rains and flooding, increase in intense tropical cyclones, disruption to agricultural productivity from extreme weather events. The evironmental and economic impacts are already visible. A recent study found that heatwaves are costing the Australian economy $7.2 billion in lost productivity. "The security implications are known, real and have begun. So too are the environmental and economic impacts. On present form however, it seems that a ‘burning crisis’ combining economic, security and environmental impacts will provide the tipping point. Australia can ill afford to wait." says the report. So the Abbott Government is even leaving our Defence Forces in the dark, and by implication the security of all Australians, blinded by their ideological pursuit of enhancing the dangers of climate change with inept climate policies, exceptionally low climate targets and support for fossil fuel and coal industries. As it says in the foreward to the study, "As we enter this conflict we currently do so with at least one eye shut."